The Usher syndrome phenotype is comprised of ocular and audiologic anomalies. Patients characteristically experience congenital hearing loss, nyctalopia, reduced visual fields, and ultimately decreased visual acuity. However, diagnosis may initially be more difficult in cases with limited ocular findings. Here, we present a case in which an adult patient had neither subjective visual complaints nor ocular findings at the time of diagnosis aside from a moderate reduction in rod and cone function on electroretinogram testing. Nevertheless, 43 years after his initial examination, he showed severe degenerative changes in the retina. 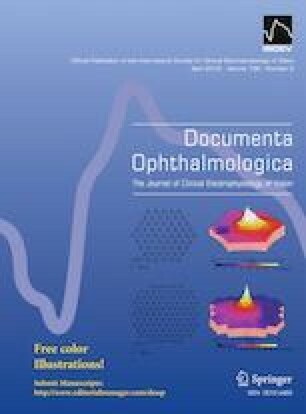 A 63-year-old man with Usher syndrome type 2 underwent ophthalmic examination that included visual acuity, optical coherence tomography (OCT), electroretinogram (ERG), fundus photography, and Goldmann visual field testing. The patient also had genetic testing performed. We additionally reviewed the ocular findings on two of his siblings also afflicted with Usher syndrome type 2. Our findings documented the long-term progression of Usher syndrome in this patient. They showed that the patient was asymptomatic with only a moderate reduction on ERG testing at the time of diagnosis, but subsequently progressed to an advanced stage of retinal disease with severe visual loss. The patient demonstrated that the absence of visual symptoms and favorable findings on functional testing on initial presentation might yet belie a future for austere visual loss. Caution is thus warranted when predicting a visual prognosis in such a patient. Further, the value in electroretinographic testing for diagnosis is demonstrated.